"Yes, the Golden Tree," said Misty sadly. Ace froze and stared at Misty. The blue flame in her eyes and Jen's were gone. Ace saw that, despite the fact their journey was almost over, Misty and Jen looked very troubled. Then it hit him. "The Sword is gone," he said in a deep voice, as if to himself. He sat down on the flat, dark stone and held his chin as if in deep thought. "What happened? And are Shane and Midnight just unconscious?" he inquired after a short silence. "Yeah, just unconscious," said Misty slowly. "And this is what happened. While everybody was asleep, I heard a strange hum further down the hall. Curiosity took me over, and I decided to go see what it was." Misty then told Ace everything up until the point where she had felt the evil hand grab her shoulder. After that, she remembered no more. Jen then told what had happened to her, and the story was the same. Misty then took up the story again for when she finally could remember. "When I was conscious, I was in a black area. No, not just black. It was like, well, when I looked around me, it's like I looked into infinite. I saw you guys laying on the ground unconscious. I then found Jen next to me shaking and holding her head. Then, there was a voice. In some sort of hideous voice, it told us what happened. There was a dark flame in our eyes, and we had knocked you unconscious with them. We were possessed, though, so we couldn't stop it. Then, it appeared. All I'm saying is that me and Jen(who still had our battle items from the Lupes) fought it, and got away from it, and saved you. He still has the Sword. I will say no more." "And here are everybody's weapons," said Jen as she took a step to the left. Behind where she was just standing were the bags the Lupes gave them and Shane's sword. They then heard Midnight and Shane moan at the exact same time. They sat up holding their heads, and turned to see Ace, Misty and Jen. They gasped at the sight of the Tree far behind them, and not to mention Misty and Jen alive. "The Sword isn't here, Midnight," said Ace as he stood up. Misty then told Midnight and Shane what the forest was called and what happened. Midnight's head dropped and faced the ground. "So we're all going to die," she said. "And our owners, and everyone else in Neopia. We have failed." "No, we haven't!" shouted Misty. Her voice was strangely firm. "I do not guess, either! I know that there's still a chance, but I don't know if we'll succeed or not. I'll tell you how I know. Midnight, remember a while back when you were trying to get that secret out of me? You know, that I started to mention when we first met Ace? Well, this is what it is: I've been having dreams. Dreams, that happen later in the day. Dreams that come true later that day or another day! Like, remember how I knew there was a trap door in the wall in that castle-like place? I knew it was there because I dreamed that all that happened! I dreamed that we were running from the Kougra Twins, and that we ran into the wall and were safe. That's how I've known all things like that lately." All were astonished to hear this. 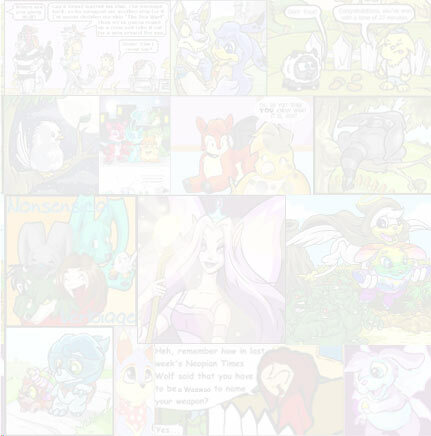 Of all Neopets in the world, Misty got the special Faerie-like ability to dream about what would happen the next day. Jen was the only one not surprised, because Misty told her earlier, before anyone else woke up. Then very quickly, all eyes were drawn away from Misty, and closed as they faced toward the ground. 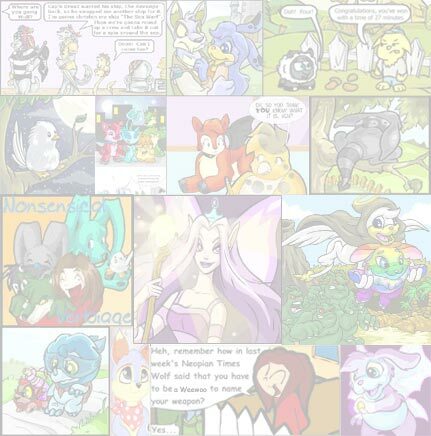 A piercing laugh was just heard which made the 5 Neopets cover their ears as they held their heads. It hurt their ears terribly. "YEEDWAHAHAHAHA!" it went. Then, unwillingly, their eyes opened. In front of the flat stone, on the opposite side that Misty and Jen were standing at, floated the dreadful demon that Misty had described in her ghost story. A floating Skelliten with no legs. Rotted pieces of meat hung off of it's bones. It's face was impossible to see, because there was a green light surrounding it lightly. The rest of it's body was also covered with it. Two dark greenish yellow fangs came out from it's chin. There was the foulest smell the 5 Neopets had ever smelled before that came from the evil creature. The 5 poor Neopets jumped up and started to run for their lives, but Midnight stopped after she stood up. The others continued to run. Midnight turned around, and strangely, there was no look of fear in her face. If she felt it in her heart, she did not show it. Anger instead was on her face. "YOU!" she shouted. At this, the others stopped, and slowly turned around. "YOU! It was YOU who stole the Sword the first, AND second time!! No, NO MORE running! I'm staying right here until you show the Sword! I KNOW you have it!" Her voice seemed powerful and strong. She spoke without fear, and little doubt; but still, something was missing in her voice. The floating thing spoke with a wicked voice. It was very tumbled and mixed, and he hissed as he spoke, or tried to speak. "Yesss, indeed, you know I has it. Hraah! But does that mean you will get it? No, no!!!" Shane wondered how it spoke without a mouth. "I won't, eh?" Midnight answered firmly with a grin on her face. "We'll see about THAT!" Midnight jumped back and grabbed her bag. She then turned to the others, who were only a few feet behind her. "Grab your bags, now!!" They did as they were told, somehow, also without fear. Since Ace had nothing, and Misty already wore her weapon, they stood beside the others(who had their bags weapons out and ready) and got in a fighting position. Something was literally speaking to them on the inside, but not a voice that was evil. The strange Demon lifted his rotted hand into the air and chanted very, very weird words, and there in his evil hand, suddenly appeared the Sword. "And alsso," it said presently, "my name iss Leon. Yess, Leon, the Kougra type thing you saw long ago. SHAAA!" Then a loud and firm roar was heard throughout the entire forest, but it was not the roar of Leon. Then the fight began. Midnight jumped in the air towards the Demon with her chain swinging high in the air. The faster she swung it, the more and more it turned from metal, to a precious silver. Shane jumped with her with his sword straight out in front of him. Jen with her Lightning Gun, Misty with her strange necklace, and Ace(who seemed to have nothing), followed behind the two with loud shouts. Shane struck first. His sword hit the hideous demon in the ribs, but it swung him backwards, taking no effect. Midnight threw one end of her chain towards the creature, and it wrapped up around it, squeezing the life out of it. For a second it struggled, but it quickly took the Sword and hit the chain, not causing it to break, but causing it to jump off of the Demon, and whimper on the ground, as if a Lupe who had just been beaten. Midnight flew back just as Shane did. All at once, Jen shocked it with her gun, a Blue light like lightning shot out from Misty's necklace and zapped it, and Ace held his paw into the air, out of which came a white beam with purple around the surface of it. All at once these powerful attacks hit the demon and shook him terribly. He was surrounded with what seemed gold lightning. But he held the Sword high in the air(although, not with ease. He struggled his rotting hand into the air with all the beams hitting him), and the powerful beams disappeared into the tip of the Sword. He then pointed it at Ace, Misty and Jen, and the same powerful lightning came out, and shocked them. They yelled as they felt their bodies being filled with fire and lightning. "Mrahaha!! It'sss not any usse, you foolss," said the hideous demon. "I have the Ssword, the mosst powerful weapon in the world, oh yess! It can and will absorb all your power and throw it back at you!! You CAN'T win!!!" Midnight slowly sat up. She saw suddenly Jen, Ace and Misty being destroyed with this powerful beam from the Sword. She jumped up with a yelp of horror. She felt fear again. She felt sweat running down her forehead. Shane presently sat up and saw the same, grabbed his sword and started to run towards the Demon. Midnight started to follow, but then something came to her mind, as if something else was telling her heart. The sharp may be strong, and carry great power, but once you at last get down to the very last hour, the strong will bring healing, not blood or the end; for causing that will bring you your very last breath. Use the help from the Great Golden Tree to help the strong heal all that may be. But you will not see it, and you will know grief, and that's when you'll need the single Gold Leaf. Once you have both Strong Death and Life, bring them together, and fear no knife; for the knife will turn when it touches your skin, and so it will be for all your kin. For you have NOT the strength to kill or heal! So wait for the strong! The only thing that's real. "I've GOT IT!" Midnight shouted. She grabbed her chain and talked to herself as she watched Shane try to stop the demon with his sword, even though every time he hit it, it took no effect, and it just flew him backwards. "Okay, you Sword. You don't belong to me. I just found out that I cannot control you. I'm leaving this in your hands, or, or whatever you have." Midnight was surprised at what came out of her mouth. Then, the lightning stopped coming out of the Sword. The poor three Neopets who seemed lifeless fell to the ground. The demon laughed. "Sso much for you all! Two more whimpy Neopetss should not be a problem at all." He turned to Shane and Midnight, who were at his right. Shane was laying on the ground with his head on a rock. "Goodbye, my pathetic Neopetss. It'ss all over now!!!!" He pointed it first at Midnight who was standing and shaking. But no beam came out of it. The demon lowered the Sword a little, and then lifted it again. Still, nothing. "Hahahaha!" laughed Midnight with a grin and pleased face. "The Sword will not obey you!! It is not mine, I cannot destroy you with it or anything else. It can, though. It can harm you, but not if it's in my hand. Then it would be me destroying you. But now, it's going to obliterate you!!! HAHA!" The demon dropped the Sword with a hideous shriek. Jen, Ace and Misty woke up, and Midnight signed to them. They slowly stood up and ran over to Midnight. She knew what was about to happen. The demon started to flee. "I have a hard time believing you'll get away easily," laughed Midnight. Then, the Sword lifted up from the ground, and floated quickly through the air to Misty. It glowed once again with the glory of a twinkling star, and it touched the Leaf on Misty's necklace. Then it went into the air again, flew literally faster than the speed of light, and went through the demon before it could even think of hiding. A deep hiss murmured throughout the forest, and it disappeared with a brilliant flash of light. There then was complete silence. The Sword now lay on the ground right in front of the four Neopets. Midnight picked it up. "Well," said Meowth, "let's finish our long and hard journey, and take the Sword back. What else can I say?" Shane, who was sitting up in front of the stone, gasped at all he just witnessed. He held his head as he walked over to Midnight, Ace, Jen and Misty. He was hurt badly. "Are you OK, Shane?" asked Ace. "I'm perfect," answered Shane. "Let's go." They said no more as they walked out towards the precious Golden Tree. Once they made their way out of the Dark forest and set foot on the precious green grass, they felt their bodies strengthened a little. Shane felt the wound on the back of his head decrease. They continued until finally, they were standing right in front of the beautiful Tree. White light reflected off of it's Gold leaves as the light hit it. The sky was dark, dark blue with no clouds. They were surprised to see that the leaves were larger than Midnight's head. The bark was very, very dark on the trunk. Huge leaves were laying on the ground, and some were still falling lighter than a feather. The Tree was very tall and mighty. Midnight looked at the Sword in her hand. "Well, it's over now, guys," she said. The others nodded. Midnight lifted the Sword high and touched one of the Leaves with it. Then, out of the tip of the Sword, came brilliant lights of colours. Green, yellow, blue and orange. The hilt glowed a precious white. Midnight let go of the Sword, and there was a white flash of white. "Hurry up with your tent, Misty!!" shouted Jen. Jen woke Midnight out of sleep. Midnight quickly sat up to find that she was laying in her tent wrapped up in her blankets. Jen's voice was coming from outside of her tent. Midnight was greatly confused, and tried to figure out what happened. For 10 minutes she sat thinking in confusion, and finally came to an answer. "I was dreaming!!" she gasped. "Dreaming!! It was ALL a dream!!! Leon, the Sword, the weapons... and Ace... Man, I was really starting to like Ace. I can't believe it was all a dream, though. But how in Neopia is all that possible?" Midnight laughed at the thought of her thinking it was all real. "Well, it's all fake, just a dream. Nothing ever really existing, including Ace." "Ace, go see if Midnight's awake yet!" shouted Misty from outside Midnight's tent. Midnight was silent. "No, it wasn't a dream," she said slowly. She jumped up, unzipped the door to her tent and ran out to see Ace standing in front of her. "Hah, I was just going to see if you were awake!" he laughed. "You've been sleeping for ages!" "It wasn't a dream!!" she shouted. "Nope! All of it was real. But we actually made it, Midnight!!" The others ran up to greet Midnight. Shane was wearing a bandage over his head, and Misty no longer wore the necklace. "Before you guys say anything," said Midnight, "first I wanna know how Ace shot the demon with that beam. That wasn't an ordinary Battledome attack!!" "That's for you all to know another day," he answered as he lifted his paws up behind his head. They got all their camping stuff together and started the walk home. As they walked, Ace told them how he was a wild Shoyru, and that he had nobody to greet him when he got home. He just wondered the streets of Neopia looking for lost and dropped food. They told him that he could come over to visit them as often as he liked, and could stay with them. Later, Midnight soon learned that they still had the weapons that the Lupes gave them. "It's a shame we didn't get to use them much," said Shane as he walked munching on some of the food they gave them. Midnight looked at her chain that she held now tight in her paw. "Well, perhaps we'll use them for another day," she said in a thoughtful voice. Ace looked at her hard in the face. "I don't like that tone," he said. "I don't ever want to have to use them again," said Jen. "Hey," said Midnight as she turned her glance to her friends, "...ya never know." Jen sighed. "And all we wanted was to go fishing!!" she laughed. "Wanna hear a ghost story?" asked Misty. "I thought we could camp under the Brain Tree," said Alison. Hours had passed since Shoyru's part of the gang were still stuck in the lift.